you can vastly reduce your category spend, optimize your supplier base, and promote better collaboration with suppliers. We follow a 7 Step Strategic Sourcing Process, which includes spend analysis and data mining to identify savings opportunities and then sourcing the best proposals from suppliers. 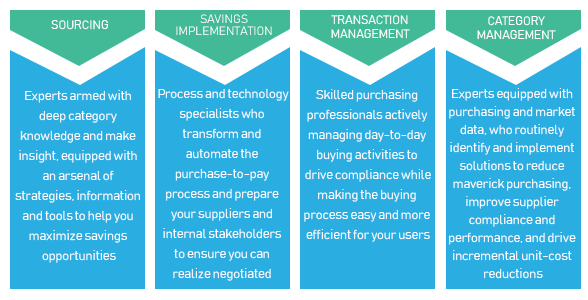 This process can deliver average savings of 10-20% on your procurement spend. Fortune 50 Sourcing Capabilities – GoProcure assists leading companies in many different industries to optimize their procurement spend with proven processes that save them millions of dollars every year. Powerful Opportunity Analysis Tool – Based on your historical data, we identify opportunities to reduce spend using the Spend Cube approach. We can then track trends and create optimal spending plans. Sourcing Optimization Tools – Rapidly develop baseline and sourcing strategies, execute sourcing events and evaluable award scenarios with cost modelling and eRFX auction optimization. Guaranteed Diversity Spend – Gain category spend intelligence and benchmarks with improved diversity of your category spend. Expertise – GoProcure’s Strategic Sourcing Team has extensive procurement experience at market leading companies across multiple industries.